In 2001 the Human Genome Project announced that it had successfully mapped the entire genetic content of human DNA. Scientists, politicians, theologians, and pundits speculated about what would follow, conjuring everything from nightmare scenarios of state-controlled eugenics to the hope of engineering disease-resistant newborns. As with debates surrounding stem-cell research, the seemingly endless possibilities of genetic engineering will continue to influence public opinion and policy into the foreseeable future. Beyond Biotechnology: The Barren Promise of Genetic Engineering distinguishes between the hype and reality of this technology and explains the nuanced and delicate relationship between science and nature. Authors Craig Holdrege and Steve Talbott evaluate the current state of genetic science and examine its potential applications, particularly in agriculture and medicine, as well as the possible dangers. The authors show how the popular view of genetics does not include an understanding of the ways in which genes actually work together in organisms. Simplistic and reductionist views of genes lead to unrealistic expectations and, ultimately, disappointment in the results that genetic engineering actually delivers. The authors explore new developments in genetics, from the discovery of "non-Darwinian" adaptative mutations in bacteria to evidence that suggests that organisms are far more than mere collections of genetically driven mechanisms. While examining these issues, the authors also answer vital questions that get to the essence of genetic interaction with human biology: Does DNA "manage" an organism any more than the organism manages its DNA? Should genetically engineered products be labeled as such? Do the methods of the genetic engineer resemble the centuries-old practices of animal husbandry? 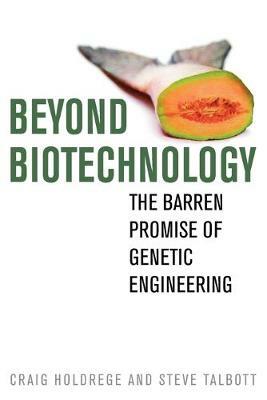 Written for lay readers, Beyond Biotechnology is an accessible introduction to the complicated issues of genetic engineering and its potential applications. In the unexplored space between nature and laboratory, a new science is waiting to emerge. Technology-based social and environmental solutions will remain tenuous and at risk of reversal as long as our culture is alienated from the plants and animals on which all life depends.